This morning on the Asteria we headed out to the mid Bank for the 10am whale watch. It was very grey with not great visibility but there have been whales sighted mid-bank for the past few days. Not far into our search we spotted a blow! 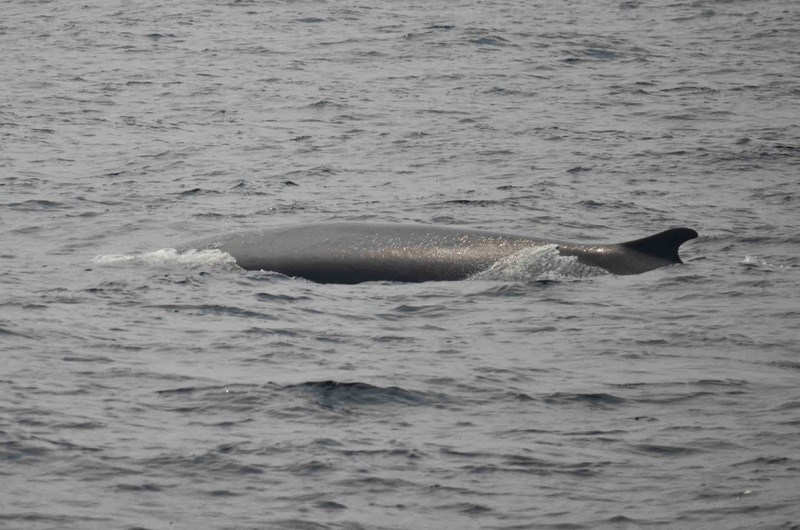 We found a pair of fin whales which seemed to be feeding in the area and were spending a lot of time at the surface. There were several other blows in the area which also seemed to be coming from fin whales. We got fantastic looks at these two large animals as they swam slowly past the boat several times. As we waited we also got quick looks at a harbor porpoise, another species that we’ve been seeing a lot of the past few days, and of a minke whale. 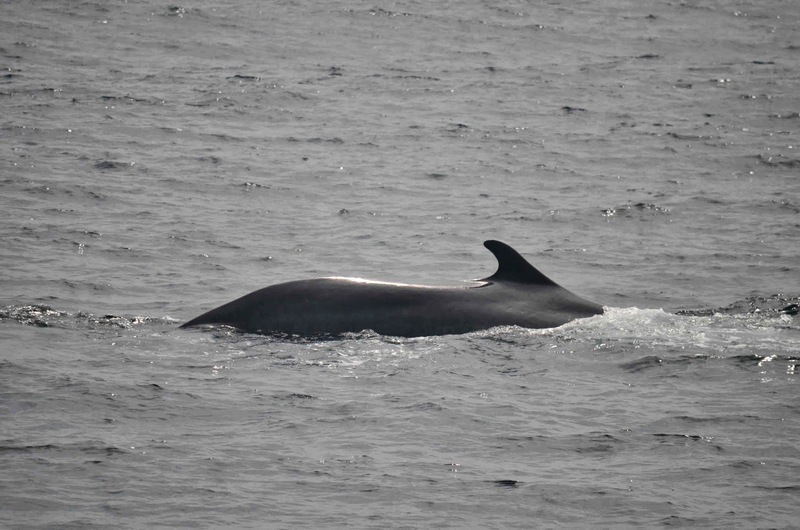 Just as we prepared to leave the area another fin whale showed up to bring our total to three fin whales for the day! 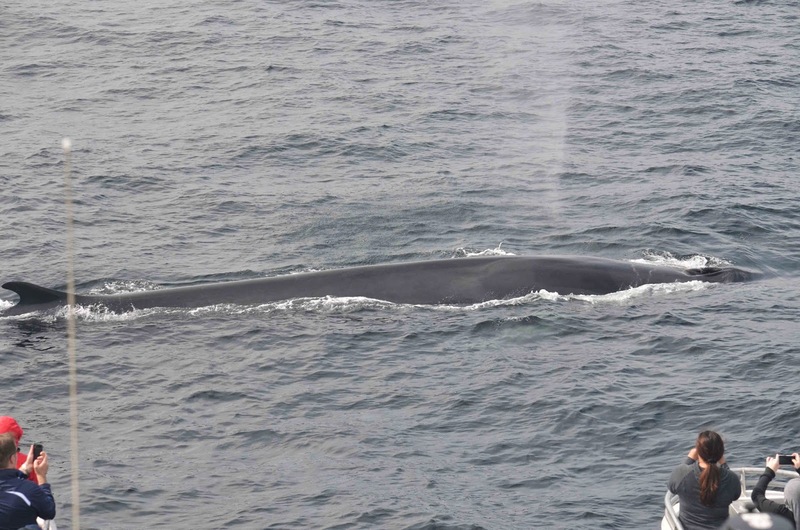 On our 12 pm whale watch we caught up with the two large fin whales right in the center of the shipping lanes. Luckily there were no ships in the immediate area to cause concern but it would have been hard to miss these two fin whales. The first fin whale was making circles around large aggregations of baitfish as it fed throughout the early afternoon. This is a common feeding behavior seen in fin whales as they try to concentrate the school into a dense workable, mass. At times, you could actually see the many fish as they were forced to the surface of the water. If you’ve ever seen this out on the water, you’ll know it looks and sounds almost like raindrops. It tricked at least one person on board who thought that it was actually raining! A number of harbor porpoises and a minke whale also joined in on the feast. The second fin whale intermittently fed and slept nearby. 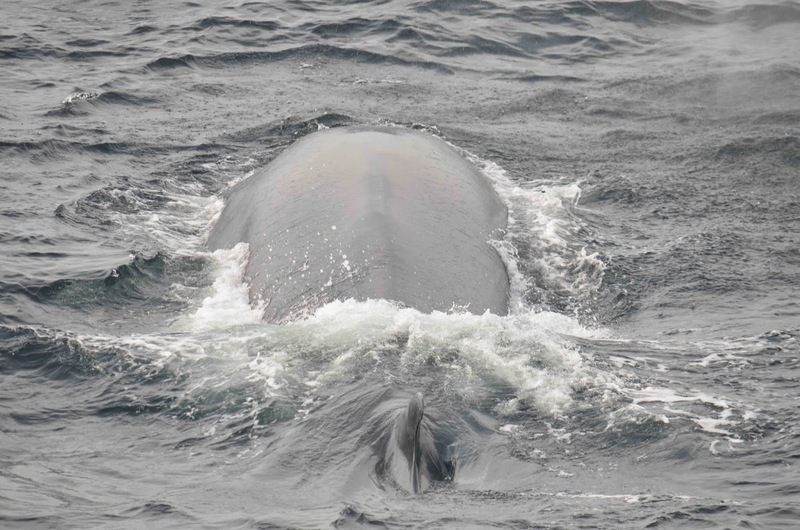 This afternoon on the 1:30 whale watch on board the Asteria we headed again out to mid bank and found the fin whales we’d seen earlier in the day. We spotted two sets of blows early into the trip and decided to watch the nearer animal. And did we pick the right fin whale this afternoon. This animal seemed to be feeding and would spend several minutes just below the surface. The skies had cleared by the afternoon and we had good sunlight to see the animal under the water. We were ever able to see the pectoral fins and the animal’s mouth under the water. This animal surface several times close to the boat and we could really see how large these magnificent animals really are. It was a fantastic afternoon with this animal. 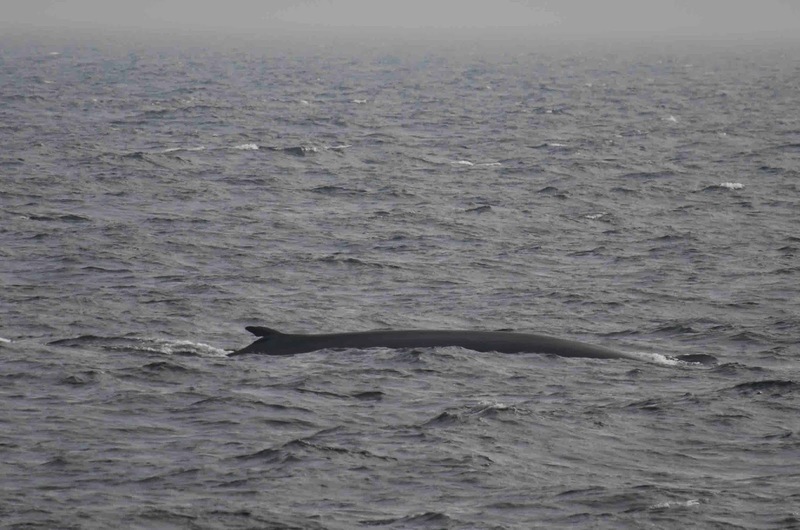 The fin whales were still in the shipping lanes on our last trip of the day but seemed to have finished their feeding activity. An additional two finners had joined the original two and we were excited to ID one as Fjord. Unlike humpbacks, fin whales are quite difficult to ID and doing so requires a lot of photographs and a lot of work. Fjord, however, has a very unique dorsal fin that has been deformed by some sort of injury, likely anthropogenic and possibly from an entanglement. Never seen with a calf, it’s assumed that he is male though we can’t be certain without a bodily fluids sample. Fjord has been seen in this area since 1981 making him at least 33 years old. While we love seeing all fin whales, it’s nice to see one you can recognize and follow from year to year!